If you don’t know how to prune forsythia, you’re not alone. This is one of the most mal-treated shrubs around. The reason: it’s a big shrub that’s usually planted in a spot that’s too tight. So everybody shears and whacks it back to try to keep its size manageable. But, remember how nature works: plants grow to a height and width that’s genetically programmed. Forsythia bushes grow seven to ten feet tall and wide, but more often than not, they’re planted where they only have four or five feet to spread. So the battle starts: constant pruning to try to make the shrub smaller. The result: forsythias shaped into ugly balls, box-like squares or hamburger buns, when the plant’s habit is naturally arching and vase-shaped. The best way to avoid bad pruning and the problems that result is, of course, to choose a spot where your shrub has enough room to spread and grow to mature size. 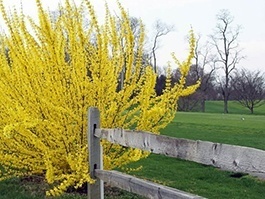 However, even sited correctly, forsythias can get quite unruly and messy-looking, and that’s where good pruning technique comes in. Don’t shear forsythia, or whack them back to make them smaller. I know you’ve even seen landscapers do it, but this is bad pruning. The best way to reduce the size of your shrub is to saw off some of the tallest, oldest canes close to ground level each year. Also prune out dead canes, and take out any branches that are rubbing against each other, or that are growing from the outside back toward the center. Then prune a few canes or branches out of the center of the plant to open it up a bit. Be sure to cut off any branches growing or hanging close to the ground. Eventually, their weight causes the tips to touch the ground, grow roots, and start another plant. To keep your shrub from running amok, cut back those canes, and rip out any rooted bits. As a general rule, remove about one-third of the old growth each year. If you follow the steps above each season, and allow your forsythia enough space, it should be able to keep its natural shape, and still look tidy and cared-for. If your forsythia is in impossible shape – either a messy thicket, or so mal-pruned that it no longer has many flowers, just cut the whole thing to the ground in late winter. New canes will grow from the roots, and you’ll have a refreshed plant within a season. You can prune this shrub before flowering, even though the standard advice is to wait until after flowering. It won’t hurt the plant, and if you’ve got a misshapen shrub that no longer flowers well, you haven’t got flowers to lose anyway. The annual shape-up pruning routine described above is best done in late winter or very early spring before flowering. The reason: When the shrub is bare, you can really see the branching structure, and it’s easier to get into the middle of the canes with your pruning tools. Wouldn’t you rather forgo a few flowers in favor of a good pruning job? Besides, you can take some of the cut branches inside to force blooms in a vase for a welcome touch of spring.